Here are some pictures of my 2015-2016 classroom. 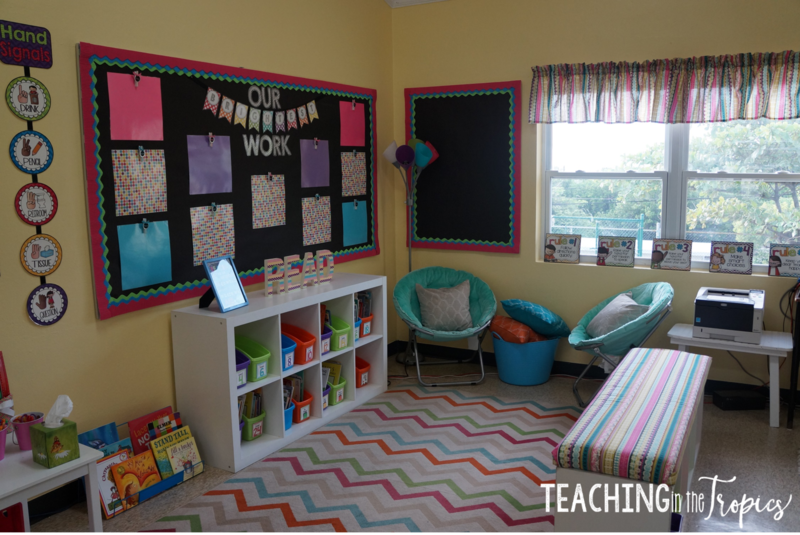 If you would like to see my current classroom pictures, check out my classroom tour here! This picture was taken from my teacher table. It shows my classroom library, student desk/board area, and our whole group learning area in front of the Smart Board. 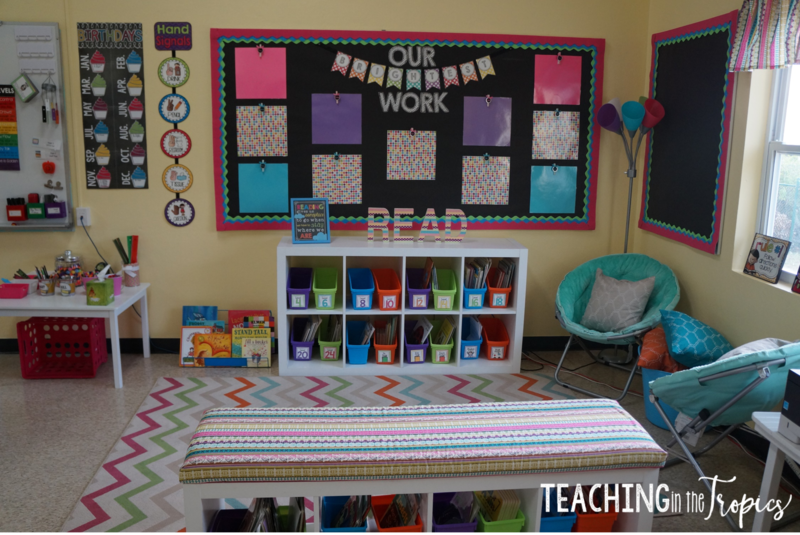 My classroom library is my favorite part of the room! This picture was taken at the very beginning of the year, which is why there are no bulbs in my colorful lamp (ha!). I have also added a small white antique table between the two chairs since this photo was taken. The pillow tub has been moved under the small white table that you can see in the far right corner of this photo. This is a close up of one of the clothespins I made for my student work board. I purchased a set of blue, green, and pink patterned clothespins from Michael's and then bought some chalkboard tags and ribbon from Target. 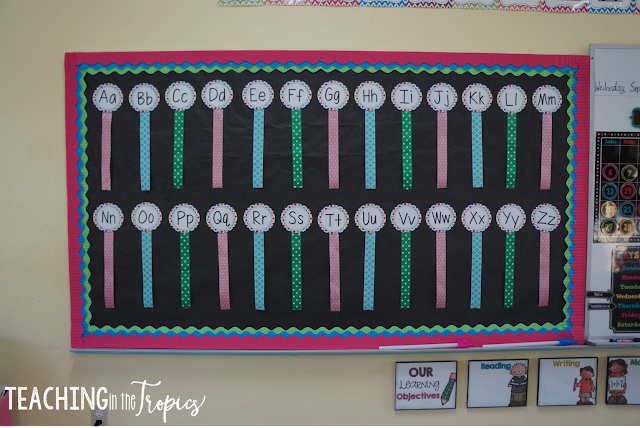 I used chalkboard markers to write my students' names on the tags, tied some ribbon to them, and then hot glued the tag to the clothespin. I love the personal touch it gives this area! The kids are always so excited to see their names on the clothespins! 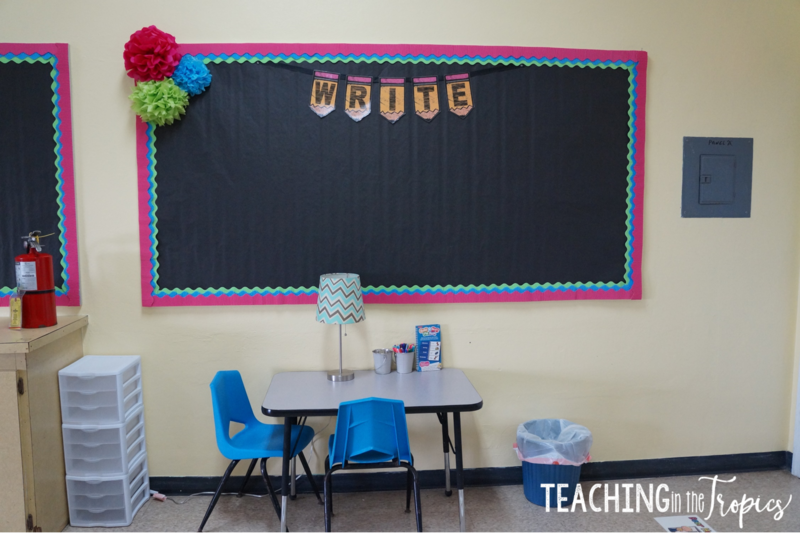 Along the back wall of the room near our classroom entrance, you will find my writing board. It now has writing choices for Work on Writing from Mel D's Ultimate Writing Station pack. (The "Write" banner is also from this awesome pack. I highly recommend it if you are looking for something to spice up your Writing Center!) I also use this board to display anchor charts we make during Writer's Workshop. The Sterilite drawers are now labeled and contain special paper for each writing choice. This is the front of the classroom, with our whiteboard and word wall. This is my first year incorporating calendar time into our morning routine. I love the look of this chalkboard brights calendar set from Teacher Created Resources. It didn't have a "How Many Days Have We Been in School?" component so I made my own poster and we are tracking using magnetic base ten blocks. The visual direction cards on the board are a freebie from A Cupcake for the Teacher. The voice levels poster is also a freebie from Jasmine McClain. Over to the right, you will notice my birthdays display. In the past, I have dedicated an entire bulletin board to this, but this year I decided to downsize my birthday display. I love this birthdays poster from Cupcakes n Curriculum. It is the perfect size and helps me to keep track of class birthdays. 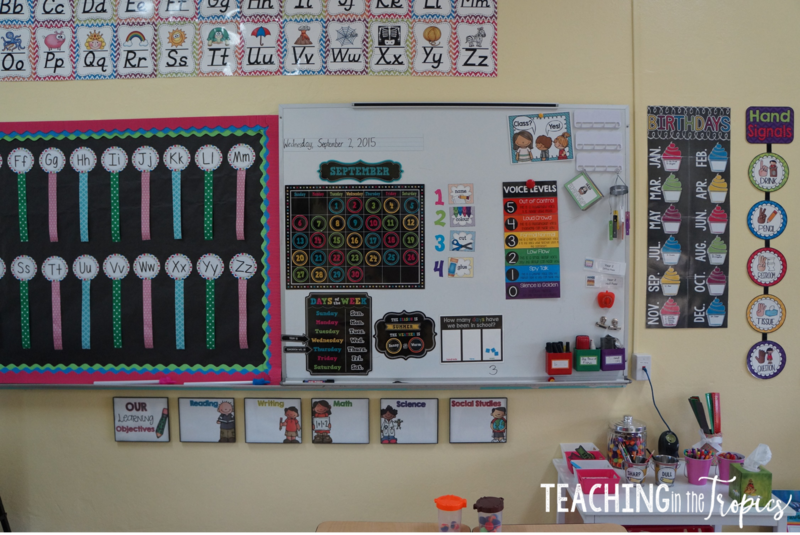 Above the whiteboard, you will notice my alphabet posters. These are from Miss Giraffe. 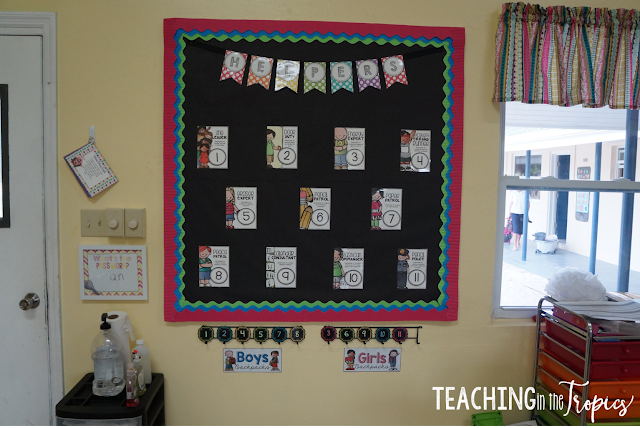 The word wall board is actually a green chalkboard, so I covered it and it works great as a magnetic word wall. It is easy to add words this way and the kids are able to borrow the words if necessary and return them once they have written them. The word wall headers are a freebie from Jessica Hursh. I used glue dots to attach ribbon to the back of each one and love how it turned out! My learning objectives are displayed under the whiteboard, at eye level for students. They are in frames so that I can easily write objectives using a dry erase marker. 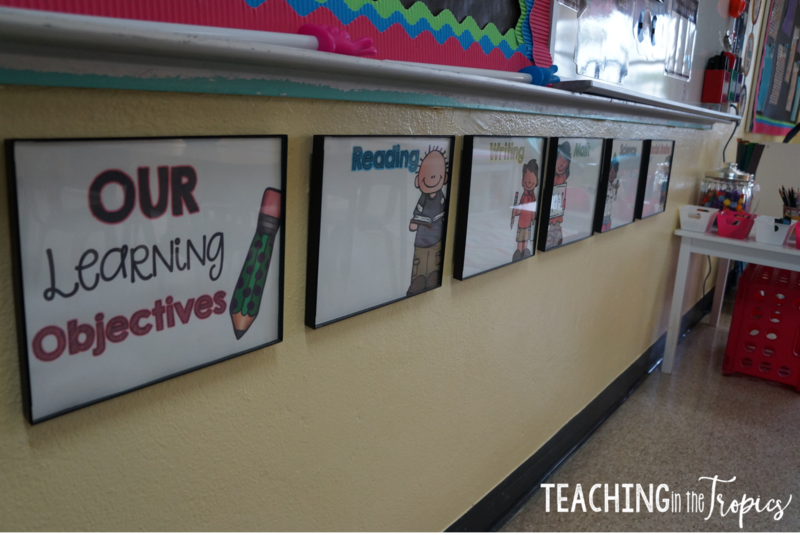 The adorable subject posters are from True Life I'm a Teacher. I created the "Our Learning Objectives" poster to match the others. 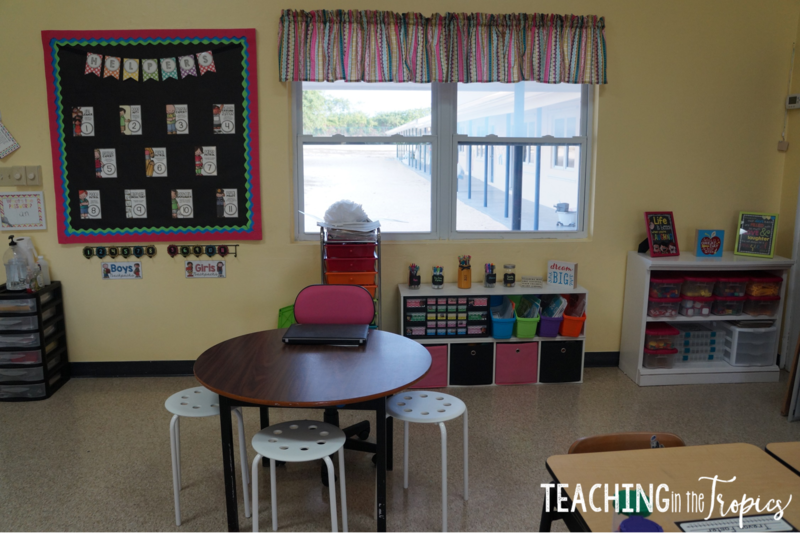 To the left of the desks, whiteboard, and word wall is my small group table, which also doubles as a teacher table. Last year, I started with a desk but got rid of it mid-year to save space. Even though I have a bigger room this year, I decided not to bring back the desk and invested in some extra storage instead. 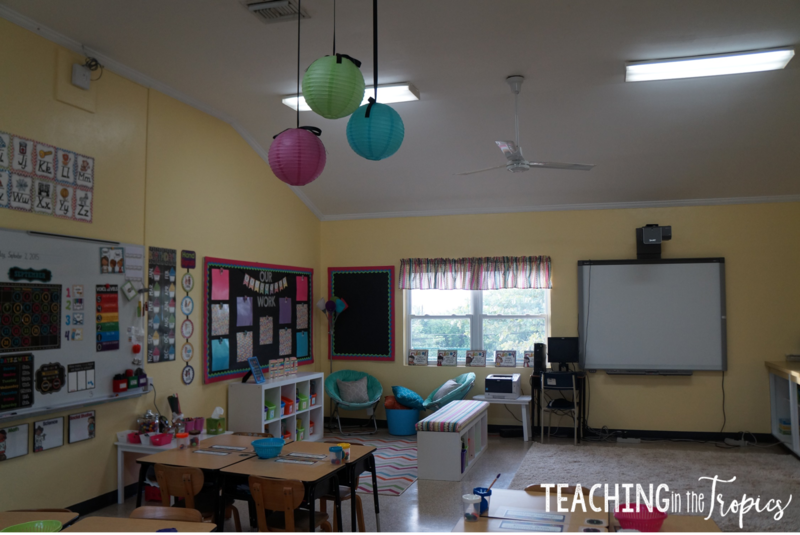 I love this part of the classroom! The area behind my teacher table makes me so happy! I love all the color! If you look closely, you'll see that this shelf is actually two separate shelves that I stacked. They are from Walmart. I originally had one of them in my classroom library, but decided to get something more sturdy to double as a reading bench. 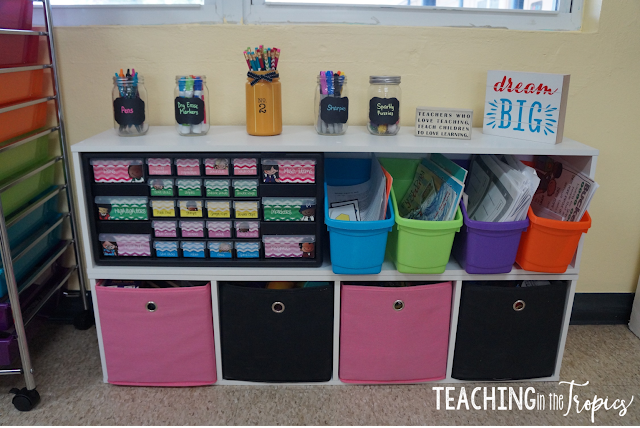 They work great in this area and my teacher toolbox fits perfectly inside! The bins on the top shelf are leftovers from my classroom library area and are being used to hold guided reading/math materials. The pink and black drawers were included with the shelf and hold various math, reading, and art supplies. 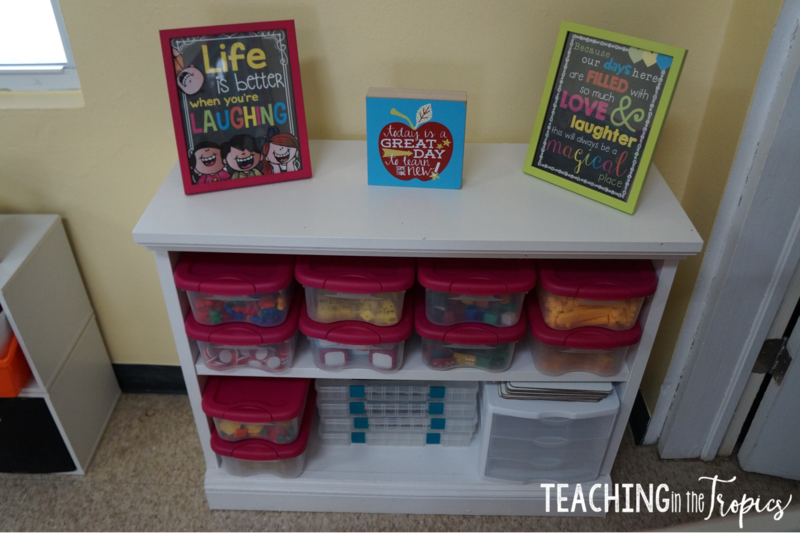 This shelf holds our math manipulatives, whiteboards, reward coupons, etc. The adorable quotes are a freebie from Khrys Bosland. I decided to frame them and I love how they brighten up this area! Right between my teacher table and the front door is our helpers board. 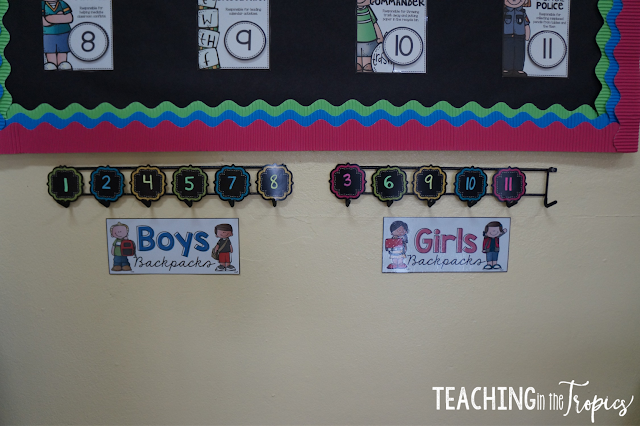 This is my first year doing classroom helpers and using a number system and it has made my life so much easier! The helpers display is from Amy Groesbeck (Can you tell I'm a fan? haha). Below our helpers board, I have hooks for student backpacks. My school has no form of cubby storage, so students usually place their backpacks on the back of their chairs. However, chairs kept falling over from the weight and half the backpacks ended up on the floor by the end of the day. This year I knew I had to try something different. Their backpacks are kind of close together when hanging there, but as long as they turn them it works great! I was originally going to put the numbers in order from 1 to 11, but when Jennifer from Rowdy in First Grade posted a picture of these adorable labels on Instagram, I fell in love! She was super sweet and sent them to me after I told her how much I liked them! 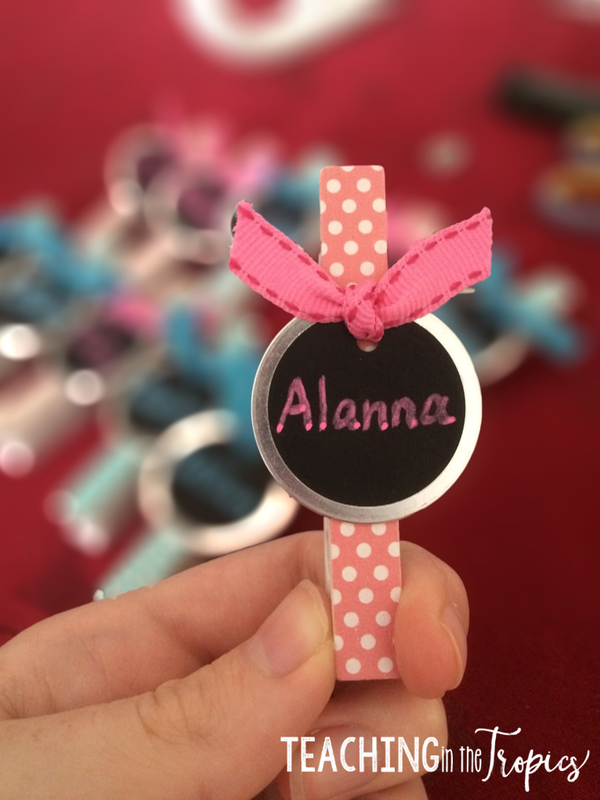 The adorable chalkboard tags are from Creative Teaching Press. I simply wrote the numbers on them using a chalk marker and adhered them to the rack with glue dots. I realized I forgot to take pictures of the rest of the back wall where my counter is, but oh well, you get the idea. :) I hope you enjoyed the virtual tour of my home away home! Those posters are from A Year of Many Firsts on Teachers Pay Teachers. 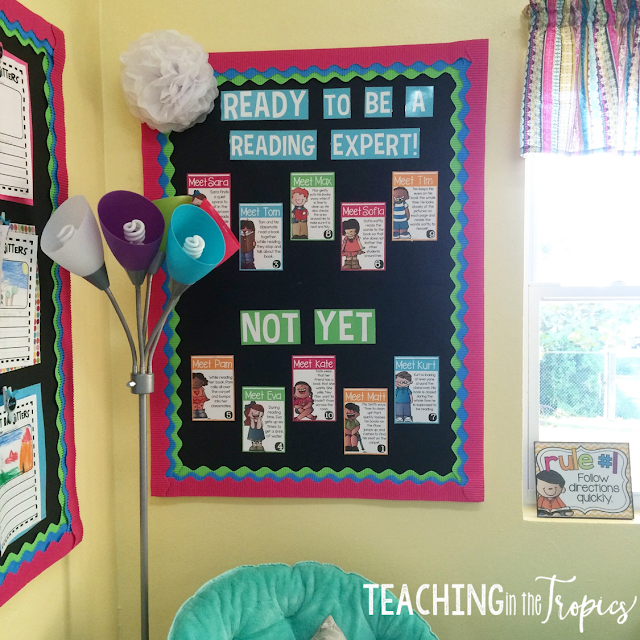 She has a product called "Be a Reading Expert" and the posters are included in it, along with a bunch of other great resources for introducing Read to Self or Reader's Workshop. They are scenario posters, so the characters are made up. The text under each name gives a scenario (such as "Max gets up from his reading spot four times to get a drink of water.") and I get my students to tell me whether the character is reading to be a reading expert. So we do it as a sorting activity during the first couple of weeks of school.